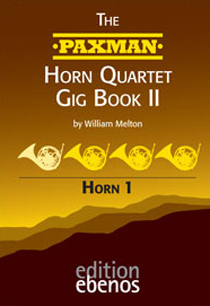 "We have come to expect scholarship and innovation from William Melton and in my opinion the contents of the new Gig Books are even better than the original set. …These Books will repay players at all levels on many levels and will give lifetimes pleasure. I can't recommend them highly enough." "It is hard to overstate how much fun my students and I had working our way through these little books. 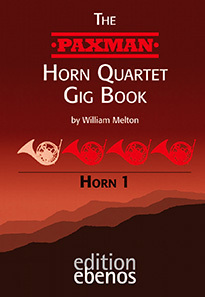 In all, we are presented with 89 individual pieces in convenient spiral-bound part books that cover just about every occasion a gigging horn quartet might need ... Concert pieces range from the Renaissance to the early 20th century, and their are some real nice surprises there -- since William Melton is the compiler, this should come as no surprise ... Any working quartet which hasn't already compiled their own gig books should own these, and it is likely that there are enough new or unknown pieces to make it worthwhile for any quartet, for any occasion." 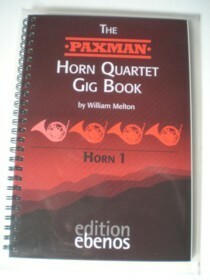 "The 'Green Books' did sterling service but now, sponsored by Paxmans, comes a compendium of far greater musical scope and erudition from William Melton ... The print quality by edition ebenos is superb: each book comes ring bound and in its own plastic wallet [available separately] ... In addition, it must be pointed out that Melton has put online some of the most readable, user-friendly programme notes that I have ever seen -- worth taking a look at for one's education alone ... I am quite, quite sure that this fantastic collection will be with us forty years hence."